I cam across an ad for this Farfisa Mini Compact organ in one of Chicago’s west side practice warehouses. After emailing the seller (a noted local rock critic!) on the spot, I came back a week later, gave it a brief spin and picked it up. It was producing a pretty loud dissonant drone (like every key was being pressed down at once), and the configuration of the power input and sound output jacks were pretty weird. I took it to DelTronics, and for $300 they completely recapped everything, upgraded the power plug and made it nearly good as new! Fine by me! The thing that’s cool about the Mini Compact is its knee-operated tone/volume lever. This is a little paddle that hides in the body of the organ, under the keys, that’s designed to be played with the knee while sitting. Nudge it to the right and it really blows out the signal. This takes it from churchy to super garage fudged up spectacular. 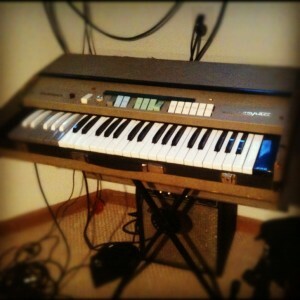 Update: I sold the Farfisa to Nathan Johnson of The Yolks/Uh Bones/Randy Records. He’s putting it to great use, give him a high five next time you see him.